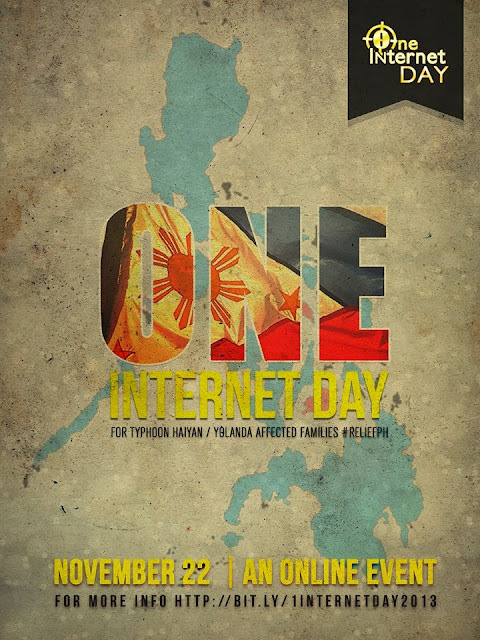 On November 22, 2013, a free online discussion dubbed as One Internet Day is going to be conducted to help encourage support to families in the Philippines affected by typhoon Yolanda (Haiyan). We encourage our friends in the international community to share their expertise on this day and donate for a good cause. 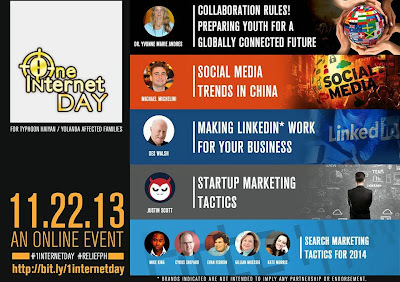 The information you are reading now was lifted from One Internet Day Facebook Event Page. This webinar event is a fund-raiser for families affected by typhoon Haiyan in the Philippines. We request all participants joining this webinar to support this cause and donate to any of the following charities (or your preferred charity organization). Donation date must be from day of sign-up to November 23. Today’s technology enables more relevant interactions than the international pen pals of past generations. This session will present solutions that can help youth learn the skills they need to build strong and compassionate communities — and effectively compete in the increasingly flat world and its global economy. From highly regarded cultural programs, to the latest tech tools that facilitate global collaborations, this session will inspire you to learn the Rules of Collaboration. Dr. Yvonne Marie Andres is President/Co-founder of GlobalSchoolNet.org and founder of iPoPP (International Projects or Partners Place.) She is creator of International CyberFair and US State Department’s Doors to Diplomacy programs, met with President Bush to launch Friendship Through Education, and speaks at conferences worldwide. If Facebook is the leading social media platform in most countries in the world, it is different in China. Popular platforms like Facebook, Twitter, and Facebook are available in limited areas only. However, local social media platforms have thrived and created new opportunities as well. 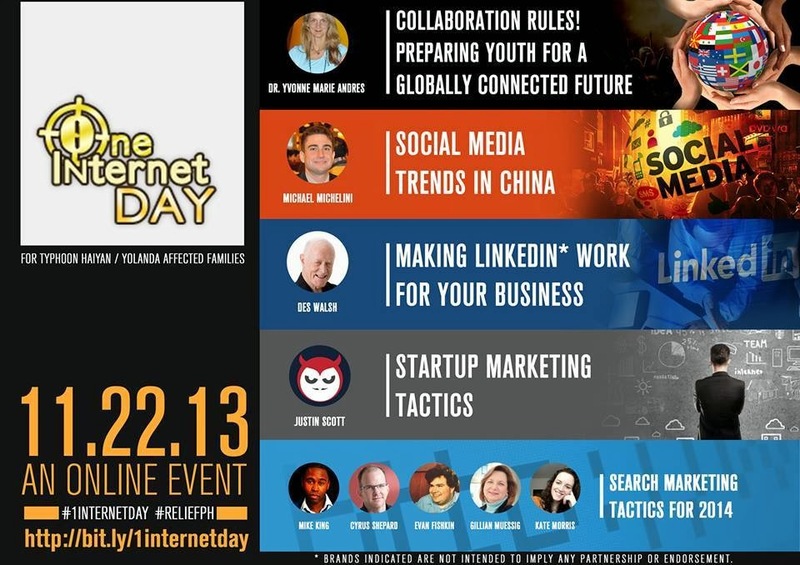 In this webinar session, American internet dude Michael Michelini who has been living in China (since 2007) will share his insight and how can companies leverage Chinese social media for business. Business coach and social media strategist Des Walsh will have an interactive session about LinkedIn. LinkedIn is constantly changing these days and even experienced people are finding it challenging to keep up. Just in the past couple of days they have taken away LinkedIn Today, which Des has been promoting as a valuable tool for managing daily updates. They say Pulse replaces it, but are there privacy or other risks now with the Pulse mobile app, as there seem to be with LinkedIn Intro? Learn more in this webinar session. Startup marketing is a unique challenge because of the limited resources, whether it’s time, money or talent. Find out some tactics that you can use to get your startup noticed. Justin Scott is a Growth Strategist at Growth Devil. He advises startups on strategy and tactics they can use to skyrocket their growth. Joining him is Mark Hayes – Growth Hacker for Growth Devil. E-Commerce is considered a driver for global competitiveness. However, there is no suitable framework that measures the significance and strategic importance of e-commerce in business. In this webinar session, Dr. Nick Fontanilla and Janette Toral will present an approach for measuring e-commerce engagement from the perspective of the suppliers and consumers. Dr. Nick Fontanilla is the President of i-Metrics Asia Pacific Corporation. Janette Toral is the site owner of DigitalFilipino.com. Through i-Metrics Asia-Pacific Corporation, an E-Commerce Maturity Index and E-Commerce Maturity Scorecard is under development and currently going through trial testing. Special thanks as well to the Marketing Festival for helping in making the Search Marketing Tactics for 2014 webinar session possible. With gratitude and thanks to Twitter and Interactive Advertising Bureau Singapore, this recorded session will be made available on our event page archive and shall only be made viewable to those who pledge – along with other webinar videos of the day.